Chiappari, Christopher L. (2002). “Toward a Maya Theology of Liberation: The Reformulation of a "Traditional" Religion in the Global Context”. Journal for the Scientific Study of Religion 41 (1): 47–67. doi:10.1111/1468-5906.00099. Grube, Nikolai (2006). “Maya Today - From Indios Deprived of Rights to the Maya Movement”. In Nikolai Grube (Ed.). Maya: Divine Kings of the Rain Forest. Eva Eggebrecht and Matthias Seidel (assistant Eds.). Cologne: Könemann Press. pp. 417–425. ISBN 3-8331-1957-8. OCLC 71165439. Mooney, James, Herbermann, Charles, ed. (1913). 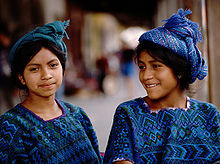 "Maya Indians" . Catholic Encyclopedia (in English). New York: Robert Appleton Company. Restall, Matthew (1997). The Maya World. Yucatecan Culture and Society, 1550-1850. Stanford: Stanford University Press. ISBN 9780804736589.